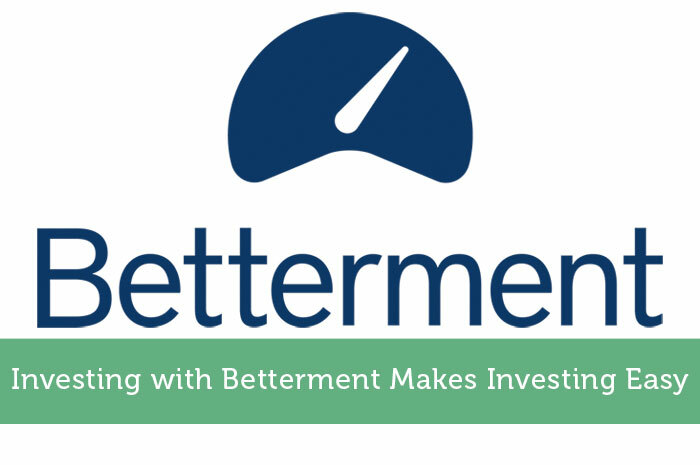 Betterment is a company that makes it easy and affordable to invest in stocks and bonds while making good returns and minimizing fees. They give you diversity by giving you access to 12 asset classes that are varied across funds that hold diversified ETF’s. In addition, you can own a mix of stocks and bonds all in one place. Besides access to US based companies, Betterment also offers funds with exposure to both international and emerging markets. 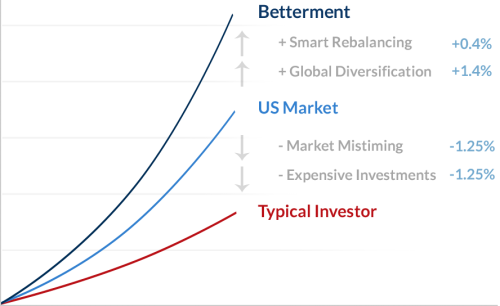 In addition, because of their low fees, Betterment gives you better performance than you would get almost anywhere else. Many people aren’t sure if they’ll have enough to retire. Many others don’t take the time to project what they’ll have in 20 years if they follow their current investment model. There are millions of people that are 10 years away from retirement or less and can’t sleep at night from the stress of retirement planning or the realization that they won’t be able to retire when they want to. Betterment offers proprietary tools to help you stay on track for retirement so that you can get rid of all that stress and sleep better at night. 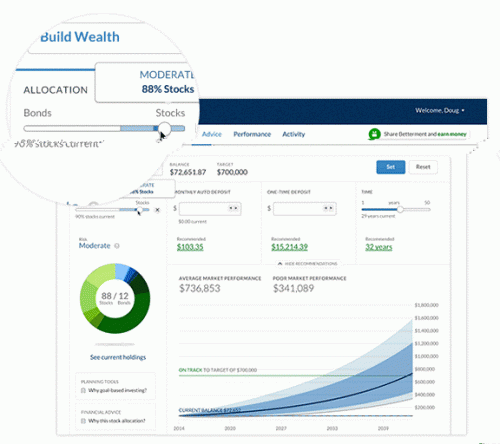 By sliding an investment allocation bar provided in your account tools, you can see future income and fund projections for the given allocation setting. This estimation is based on Modern Portfolio Theory modeling as its foundation and has been shown to be extremely accurate in forecasting investment returns into the future within a given range. It’s really that simple, by sliding a bar, you can project your account performance over many years into the future and stay on track to meet your goals. So if you’re looking for a low cost way to amplify your investment returns, pay less fees and free up some time in your busy schedule, give them a try by following the link below to learn more about how Betterment can help you achieve your investment goals and to sign up for an account. I have never heard of Betterment. I will have to look more into this. Interesting read, I will have to look into Betterment to learn more about it. Do you use Betterment yourself? Seems very promising, indeed. I’d second the question: do you use their services yourself? It’s always interesting to know what services or products our favorite bloggers do use. One of my office mate mentioned betterment once, and she’s been using its services for quite some time. This is really new to me, but I will try to research on this further. You know I am kinda curious about investing.